It's a gentle yet precise method of strengthening the deep muscles of your body, refining your perception, optimizing your posture and allowing you to achieve a smooth movement quality. For all ages, for beginners and advanced! Prerequisite are the basic principles of Pilates and clear placement of the body. Exercises flow into each other with plenty of creatvity and love for movement. Your spine will feel elongated, your mind calmed down and your overall feeling will be enhanced. The SmartSpine™ system invented by Marie Jose Bloom evolved from the inspiration fueled by daily work and interaction with students and clients. With the SmartSpine you mobilize, strenghten and assist your spine. It promotes ease during the day and better sleep during the night. The warm device helps you to locate and train your deep muscles effectively, especially in the abdominal and back area. An amazing treat for body and mind. Working with the BALLance balls is pure relief for the back muscles and the intervertebral discs. The back is specifically mobilized and raised. Fixed vertebral segments are deblocked and tensions are released. Lightness, calmness, posture, breathing and sleep are positively affected and holistic changes are quickly perceived. Pregnancy, childbirth and motherhood bring great joys and challenges. You will learn more about your self-perception and work on both your inner strength and your relaxation. We prepare you with the aim for a spontaneous birth and accompany you during this special phase of your life. The courses are offered as 10-week programs, the individual lessons build on each other. Strengthening, relaxation, prevention and your general well-being is the heart of our training. Classes For further information please go back to the menu and find to offers/subsidized courses. helps you to better mindfulness, concentration, breathing and respect for you, your own body and the people around you. 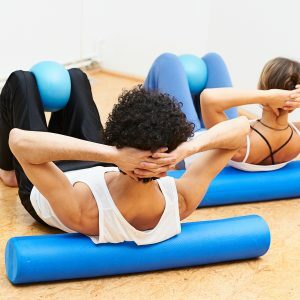 You can concentrate on strength, stretching, relaxation, movement flow as well as the connection to everyday life. In Meditation you will be lead to practice emptiness, fullness and mindfulness. Therefore you can become acquainted with your own mind, release yourself from deadlocked behavioral patterns, question your role expectations and create a healthy distance from everyday life with new mindfulness. A wonderful blend of the basic principles of Pilates and Yogaphylosophy, as well as movement elements from both. The entire body is moved, strengthened and relaxed. In the end we practice ´doing nothing´ in Shavasana or in meditation.